When the "Power Ranger" trailer hit about a month or so ago, it didn't look exactly like the television show I grew up with. I wouldn't say that this is a bad thing. I have read that some film critics feel that nostalgia isn't good for us. That its a cancer that is only making sure we stay several steps behind instead of pushing ahead. If "Power Rangers" was just a massive retread, nostalgia for the sake of it, I don't know if I'd be all that invested in it. I don't know if I could take it seriously or allow it to entertain me past a surface value. But this new movie feels different, and right now, different feels bad. 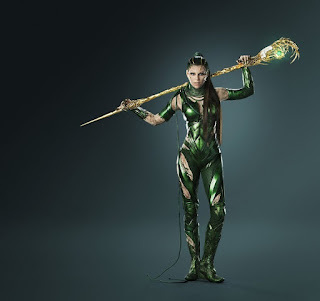 I think that can be said about Rita Repulsa, the villain of the movie, who was the iconic villain on the television show. When Elizabeth Banks was cast, I think it through many people off, simply because nobody would have expected that type of casting. She looks nothing like the old character did, and since Banks has been seemingly everywhere for the past few years, it was easy to see this as stunt casting. I have warmed up to the idea though, and I am curious more than anything about what she plans to do in the role. Yeah, Elizabeth Banks isn't going to be doing a Machiko Soga impression by any stretch of the imagination, and that's a good thing. Whatever we get next year, it will be Banks doing something entirely her own. That ain't bad.